Happy Thanksgiving! Especially to my better half who is Canadian. After class he helped me change the huge lights in the kitchen which was a huge task in itself especially after I dropped one of them taking out and it shattered on the floor, nearly taking out my poor Pumpkin who is never far away. 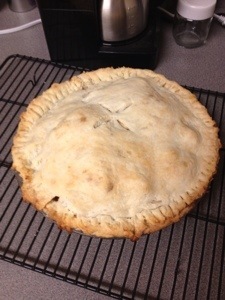 Later on, I made him an apple pie! It turned out lovely and we’re going to eat a slice in a few minutes. 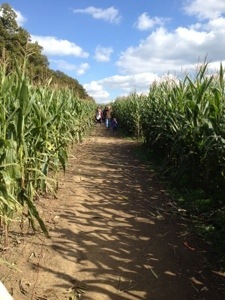 Yesterday we went out to the pumpkin patch and had a lot of fun doing the corn maze and picking out our pumpkins. I love this time of year and the time we’re getting to spend doing autumn type stuff when I have a day off. Next up – the trail of terror! Now off to enjoy some pie!